In today's blog we take a look at South Africa's "junk status" position and reference some of the points mentioned in our 4 April 2017 blog in which we discussed the the impact of "junk status" on South Africa and what it really means for South African citizens. S&P downgrades SA's local currency denominated debt as well as further downgrading foreign currency debt again. Making money borrowed by the South African government even more expensive. So why the update on the "junk status"
After the Medium Term Budget Policy Statement (MTBPS) delivered by Finance Minister Malusi Gigaba, the markets were rattled by the statements from the South African finance minster and the numbers that he supplied. 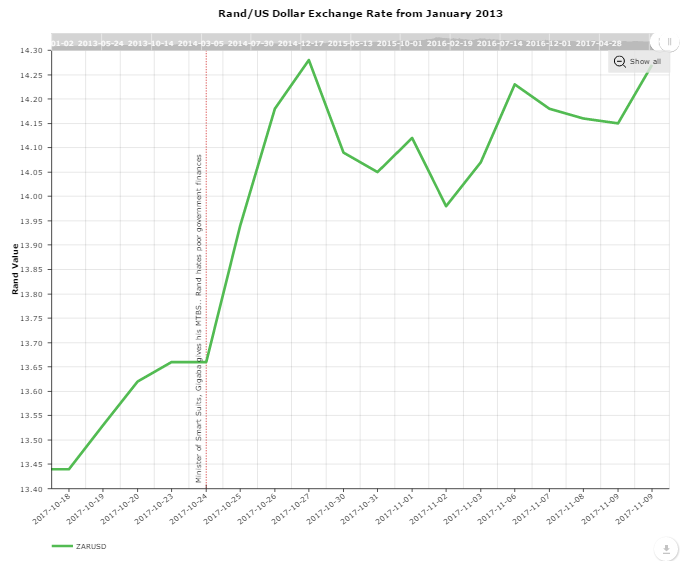 The Rand has taken a pounding since then as most analysts and commentators believe that after the "mini" budget delivered by the minister SA's credit ratings will be downgraded further (and the likelihood that Moody's will rate SA as "junk status" for the first time since democracy is basically a given). Which will mean that all three of the biggest ratings agencies Moody's, Fitch and S&P now sees South Africa's debt as sub investment grade. 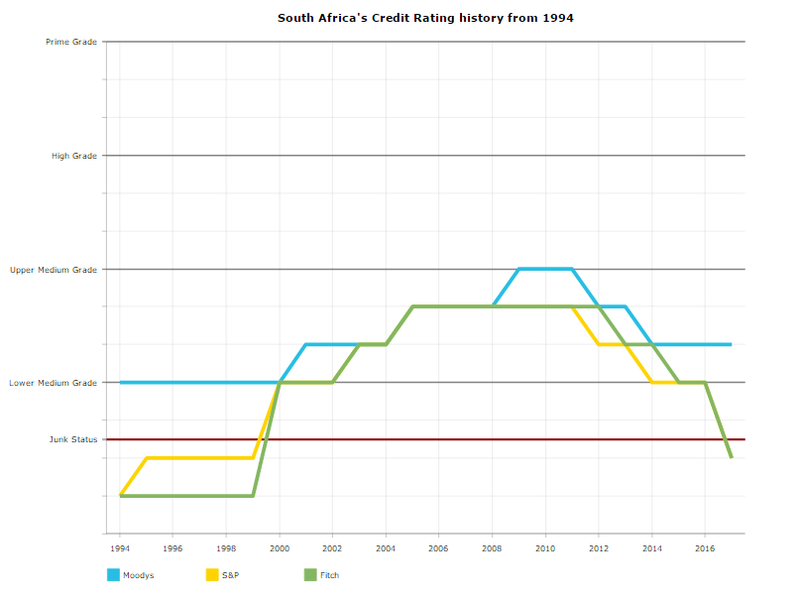 Below an interactive graphic showing the South African credit ratings by the various ratings agencies over time. Now some might say the ratings downgrades wont have a significant impact on South Africans but more on the South African government. On the 4th of April 2017 we quoted what we stated in September 2016 already as to what will happen if the we are downgraded to "junk status". Below is what we suggested will happen after we a rated as "junk status". Exchange rate will hit levels never seen before. It will make "Nenegate" look like a picnic. Inflation will skyrocket. As all imports will become way more expensive. Including crude oil which is the life blood of any economy as it powers most vehicles and machines. Government debt will become way more expensive to pay off overnight. Taking on new debt will be harder and cost a lot more. How will government finance that? Raise taxes? South Africa is already seeing a tax revolt. Think E-tolls. Cant keep milking a cow if there is no milk left. South Africa has been milking a small part of the population with taxes for far to long. Our tax net is not wide enough and is already unsustainable. Since government has to pay more money to service debt, there will be less money to provide services to it's citizens. And this will lead to more protest actions and riots. And eventually voters will finally be fed up with the government of the day, and they might finally decide that a new ruling party is needed to run this country. Continued bail outs of State Owned Enterprises such as SAA. The sluggish economic growth and high levels of unemployment means taxes collected via personal income tax and corporate taxes are not growing fast enough to curb the government's ballooning expenditure bill. If there is a revenue shortfall government has to borrow money. The more money it borrows the more it has to spend on debt servicing costs (which is money that it could have spent on providing services to the people). The worse our credit rating the higher the interest rates the South African government needs to pay on it's debt, as investors would require higher interest rates to compensate them for investing in sub investment grade debt. Leading to even more money being spent on interest on debt instead of being spent to provide services. The image below shows the depreciation of the exchange rate since Minister Gigaba's MTBPS he gave. If Moody's downgrades SA to "junk status" and the other ratings agencies cuts SA's debt ratings even further the main implication would be additional costs for government to service their debt, which essentially means more money is taken out of government coffers to pay debt instead of being able to use that money to supply services such as health, schooling, protection etc to its people. The Rand will loose value as investors will have less confidence to invest in South Africa, and as mentioned a weakening exchange rate will lead to higher levels of inflation as imported goods (in particular crude oil) becomes more expensive. And this will lead to secondary inflation effects as crude oil imports become more expensive petrol will become more expensive, which leads to transport and logistics prices going up, which will lead to wholesale and retail prices going up. And in order to curb inflation the South African Reserve Bank (SARB) will start pushing up interest rates to curb spending and reduce price increases. And with SA's already weak economy, this will seriously affect South Africa's consumers and its already poor economic growth. 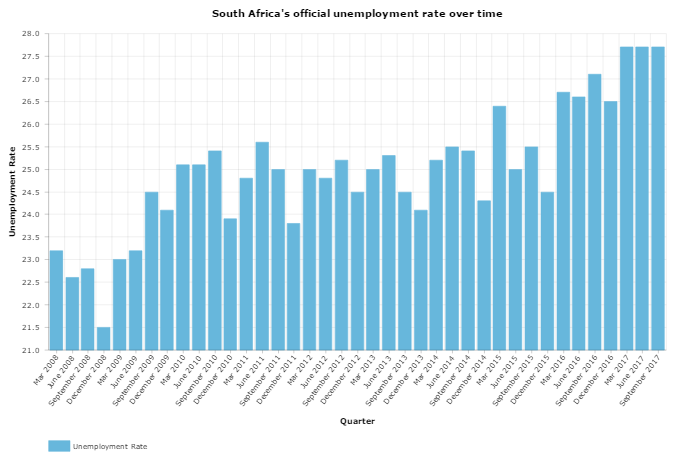 Leading to more job losses and even higher levels of unemployment (and this with SA's unemployment rate already sitting at record levels (see image below). With S&P downgrading South Africa's credit rating again on Friday, 24 November South Africa's credit rating is now at levels last seen when SA just became a democray in 1994. Sadly all the years of hard work that was put in to improve South Africa's fiscal and economic position has been undone by #statecaputre and poor governance off government departments and state owned enterprises (SOE). They include ESKOM, Transnet, Denel, South African Airways (SAA). So when anyone tells you being downgraded wont affect them, let them read this page.